A Stretch Range Rover is perfect for any special event. With its capacity and features, you and your family or friends will enjoy a relaxing ride from pickup to drop-off. As a wedding car, it can accommodate you and/or your entourage from the ceremony to the reception party. And during the ride, you get to enjoy a party atmosphere complete with refreshing drinks, lights, and sound. As a ‘cool ride’ going to an event, it is best for a party of up to 16 passengers. Create the party groove and energy while you travel from your pickup point up to your chosen destination. As always, we make sure our Stretch Range Rover is equipped with sounds, lights, and refreshing drinks for you to enjoy. 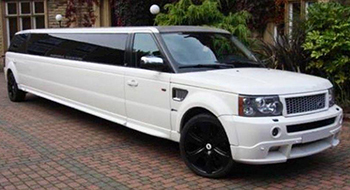 Our Stretch Range Rover is also the perfect car for a group of teenagers going to their prom. Isn’t it better to see your children and their high school friends go to their prom together? We make sure that your teenagers are safe and sound during their trip and we can also provide wholesome drinks and snacks upon request. If you are booking a chauffeured car for a group of people, the Stretch Range Rover is ideal for all types of occasions or events. Whether you need one for a small group of executives, a group of sports fans, or for just about any type of event, this is the perfect car for a relaxed and enjoyable ride. Our Stretch Range Rover is equipped with fiber optic lighting, sound system, leather seating, and a glowing bar with champagne and drinks for clients to enjoy. So, let us provide you and your family or friends with an enjoyable and relaxing ride. Contact us if you have an enquiry or use our online booking form for reservation.